Nanoprecipitates form during nucleation of multiphase equilibria in phase segregating multicomponent systems. 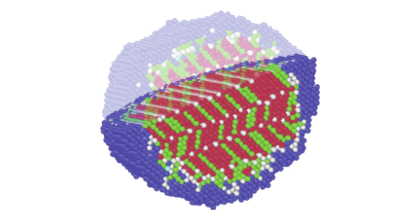 In spite of their ubiquity, their size-dependent physical chemistry, in particular, at the boundary between phases with incompatible topologies, is still rather arcane. 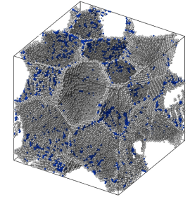 Here, we use extensive atomistic simulations to map out the size-temperature phase diagram of Cu nanoprecipitates in α-Fe. 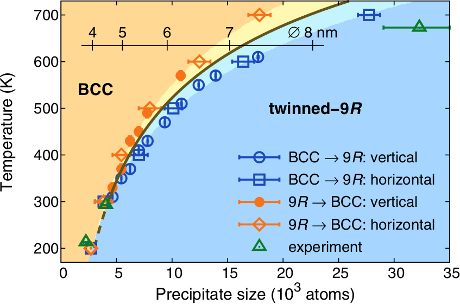 The growing precipitates undergo martensitic transformations from the body-centered cubic (bcc) phase to multiply twinned 9R structures. At high temperatures, the transitions exhibit strong first-order character and prominent hysteresis. Upon cooling, the discontinuities become less pronounced and the transitions occur at ever smaller cluster sizes. Below 300 K, the hysteresis vanishes while the transition remains discontinuous with a finite but diminishing latent heat. This unusual size-temperature phase diagram results from the entropy generated by the soft modes of the bcc-Cu phase, which are stabilized through confinement by the α-Fe lattice.